Kitchen Lights Unit No. 3 Platform & Pipeline - Global Diving & Salvage, Inc. Global has a long history of performing work for the energy sector. One extensive project was Kitchen Lights Unit No. 3, a project with Crowley Solutions for Furie Operating Alaska, to install a monopod platform and pipeline in Cook Inlet, Alaska. The Cook Inlet is one of the most challenging diving environments in the world with zero visibility, up to 30 feet differential between low and high tides, and current speeds reaching up to six knots yielding an average bottom time of 30 minutes per tide swing. The scope of work required installing a monopod natural gas platform and 16 miles of 10-inch concrete-coated pipeline. At its peak, the project involved a total of 25 dive crew members located on three different dive vessels in three different operational areas: where the gas line entered Cook Inlet on the south end, the monopod location on the north end, and the 16 miles of pipeline in between. The project started concurrently at all three locations. At the monopod location, two dive teams worked the four slack tides each day. Crews installed a template over the well conductor in order to drive a “king” pile to aid in the alignment and setting of the monopod platform. The monopod was set into place, and the team connected a 200-foot spool piece to a flange exiting the monopod, finalizing the connection from the pipeline to the monopod. The pipe-lay operations utilized the DSV Sand Island to perform ‘span mitigation’ on unsupported pipelines over 30-feet long. Over 300 pallets of Sea Crete bags were used to complete the span mitigation. Once the pipeline was secured, the lines were pigged to clean them of any impurities before pressurizing and testing. 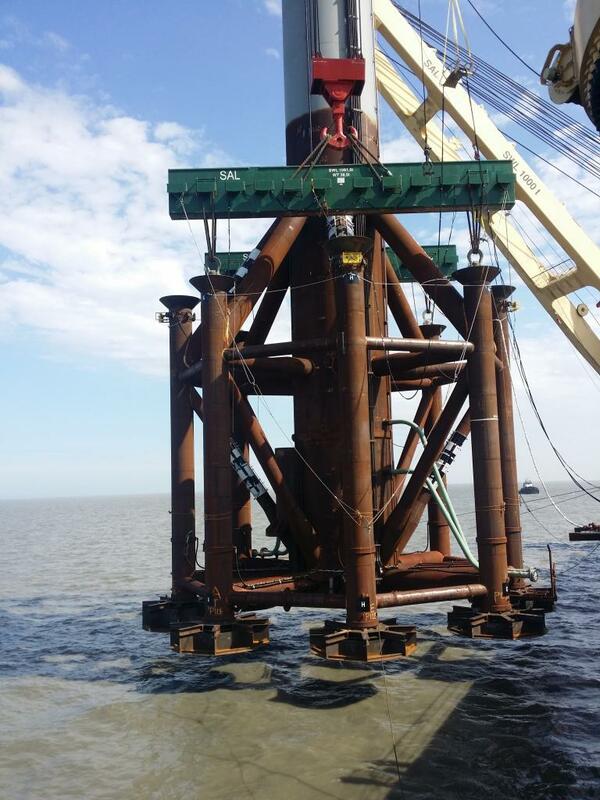 The closing spool piece was installed successfully using the pipe lay barge and the Sand Island, and work was concluded with a successful pressure test of the lines. The expansive project was completed in just over one year.